As kayaking instructors who teach rolling a lot, we often hear students comment on their flexibility. We all know that open hips and shoulders and a strong torso help with comfort, endurance and stamina while kayaking. Flexibility is also crucial for the Balance Brace and some of the more technical rolls. Flexibility in a kayak is helpful, and I can’t think of a person out there who would disagree with that point. 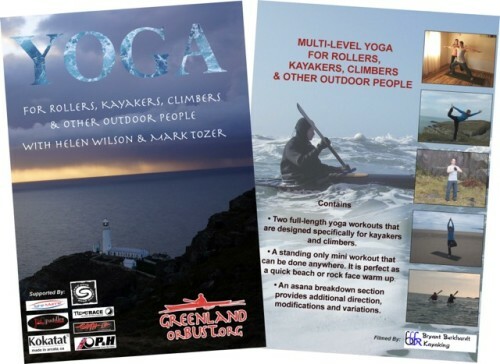 Several years ago I decided to make a yoga DVD, and the project sat on the back burner simmering, that is, until Mark, Bryant Burkhardt and myself decided to make the DVD a reality this past winter. One thing that we needed to decide on was where to film. We wanted somewhere scenic, where kayaking and climbing were an important part of the community. England and Wales seemed like the perfect place. We ran into several challenges along the way, with weather being the biggest of them. The UK had an unusually cold winter, complete with wind, hail and heavy snow, all of which can make filming a little challenging. We got through it though, and once the filming was done, we all relaxed a little. The DVD is based on a type of yoga called Vinyasa Flow. It focuses on movement with breath. Helen has been practicing yoga for over 14 years, and is a registered yoga teacher. Mark has a bachelors degree with honors in Sports Science, Health Promotion and Physical Education. The DVD contains three yoga sequences. Two are full-length, and one is a standing-only mini workout. They are multi-level, with both modifications and variations shown. There is also a breakdown section, which includes detailed breakdowns of some of the poses that require a little more explanation. We are very happy to announce that the DVD is finished and available for pre-order! It will be shipped on Wednesday, Sept. 18. We hope that you enjoy it. Following are the cover and trailer.